Common Name: Tribulus fruit. Puncture-vine fruit. Part Used & Method for Pharmaceutical Preparations: The ripe fruit is gathered in autumn, dried in the sun and baked until the fruit turns yellow. Properties & Taste: Bitter, pungent and neutral. Functions: 1. To pacify the liver and subdue the yang; 2. To promote the free flow of qi in the liver and release stagnation; 3. To expel wind and stop itching; 4. To brighten the eyes. 1. Hyperactivity of liver yang manifested as dizziness, vertigo, distension and pain in the head. Tribulus fruit (Baijili) is used with Chrysanthemum flower (Juhua), Uncaria stem (Gouteng) and White peony root (Baishao). 2. Qi stagnation of the liver manifested as distension in the breasts, uncomfortable feeling in the chest and hypochondriac regions and obstructed lactation. 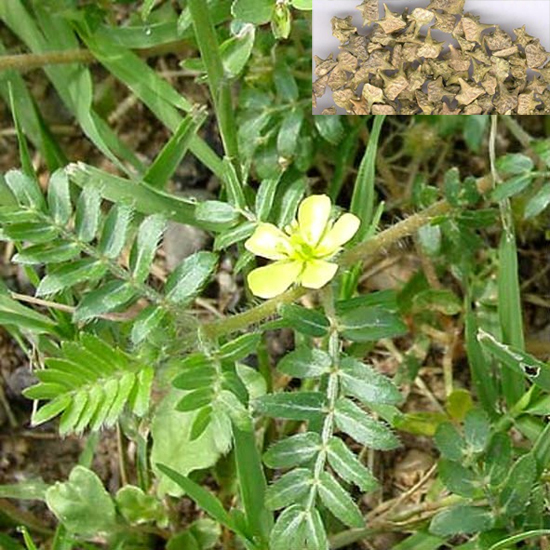 Tribulus fruit (Baijili) is used with Tangerine leaf (Juye), Bupleurum root (Chaihu), Green tangerine peel (Qingpi) and Cyperus tuber (Xiangfu). 3. Wind and heat in the liver meridian manifested as red eyes and profuse lacrimation. Tribulus fruit (Baijili) is used with Chastetree fruit (Manjingzi), Chrysanthemum flower (Juhua) and Cassia seed (Juemingzi). 4. Wind and heat in the blood manifested as rubella and itching. Tribulus fruit (Baijili) is used with Schizonepeta (Jingjie) and Cicada slough (Chantui). Dosage: 6-10 g, decocted in water for an oral dose.